Cherish Each Precious Day: It's all about the candy....corn! Today, I'm sharing a cute card made with one of the wonderful files at The Cutting Cafe. This card actually has a little window that can be filled with candy, coins, confetti, you name it! When you open the card, there's a little flap that you pull up to open up the window. 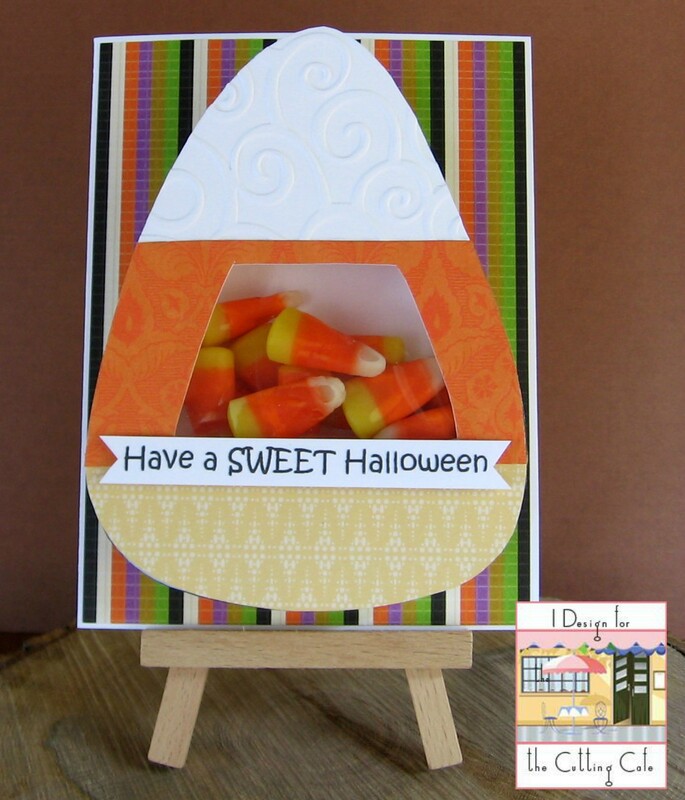 Today, I'm using a fun file, the 'Candy Corn Treat Box Card'. I've used the PDF version. All pieces were cut out by hand. No cutting machine? No worries! Just grab your scissors, print your pieces and have fun cutting! Be sure to visit The Cutting Cafe often to see what new and fun items Regina is adding! And be sure to check out the Cutting Cafe blog - there's always lots of inspiration there. Sooooooooo cute! I loveeeeeeee this!!!!!!!!!!! A darling treat box and card all in one. How fun! Sweet idea for a card! It would be fun to give these to the grandkids (or even my hubby - he has a sweet tooth). Another great box. I love how you have a window for the candy corn. I'm in the need of something for Christmas so I'll check out the site to see what grabs my attention. Another wonderful box creation! Love the candy corn box so cute, and makes it's own shaker! Sweet little treats for kids of all ages!! Nicely done, Patti.